Growing up as a boy in Ontario, I can remember on certain occasions our dinner table would have a special surprise… REAL butter. From what I remember, the butter would only make rare appearances because it was considered to be a less healthy option to margarine and should not be indulged upon frequently. So my sister and I would savour those times when we could roll our cobs of corn across a stick of butter, or drizzle some of the liquid gold over our air-popped popcorn. Knowing what I know now, I find it fascinating to look back and see the extreme differing opinions on butter and how fast society’s conceptions have shifted with respect to the accepted beliefs of its nutritional facts. Even today, largely due to the financial power and politics of mega corporations, there is still much debate surrounding this seemingly obvious topic. Sure, the Heart & Stroke foundation may endorse margarine as a heart-healthy alternative, but I personally prefer to avoid consuming a product that is almost entirely synthetic and is literally only 1 molecule away from being plastic! Let’s explore a few topics surrounding butter and fats. 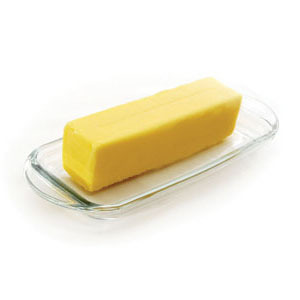 Butter is higher in saturated fats. But as modern research is proving, it is trans fats that are dangerous and should be avoided, not necessarily saturated fats. Trans fats are those which have undergone a heavy form of processing. Through chemically-induced hydrogen saturation of the carbon bonds in the fat, the structure of the unsaturated oil is changed. This alters the way the body metabolizes these fats and results in high levels of free radicals in the body. Free radicals are very unstable molecules that can create serious damage anywhere in the body leading to many problems such as heart disease or cancer. Saturated fats have been unfairly demonized through the course of the low-fat diet trends. Ironically, I recently heard Dr. Oz continue to perpetuate this fallacy surrounding saturated fats. And then, in an unrelated segment, Dr. Oz gave praise to coconut oil… a saturated fat! To me, this only emphasizes the fact that we should not be concerning ourselves so heavily on the saturated versus unsaturated debate. Instead, we should be focused on consuming high quality, unrefined fats and oils. Cholesterol is another area of concern when discussing butter versus margarine. There is a common misconception that butter causes high cholesterol. However, what most people forget is that our liver actually manufactures cholesterol and will work to regulate the amount in our body at any given time. So if we are getting a lot of dietary cholesterol, our liver will produce less. If our diets are low in cholesterol, our liver will make more. The biggest problem with cholesterol is the method by which is is transported through our bodies. Cholesterol can be carried by LDL (low-density lipoprotein) or HDL (high-density lipoprotein) molecules. The LDL is the ‘Lousy’ form since it’s role is to carry cholesterol into the blood stream from the liver, thereby contributing to higher levels of cholesterol in our blood. Whereas the HDL, the ‘Happy’ form, works by bringing the cholesterol back to the liver to be broken down. So the goal is to raise HDL levels and lower LDL. Contrary to what margarine manufacturers would have you believe, these artificial spreads can drastically increase your LDL and lower your HDL putting you at an increased risk of coronary/heart disease. Butter, on the other hand actually helps increase your HDL. It’s important for breast-feeding mothers to remember that whatever Mommy eats, baby will be eating, too. Some studies are showing that the amount of trans fats in women’s breast milk is on the rise. This trend tends to be mainly prominent in countries which have more trans fats in the food system. For example, women in China typically consume less foods with trans fats and therefore are shown to have lower levels of trans fats in their breast milk than women in North America. I’d like to encourage pregnant and breastfeeding women everywhere to take a closer look at the quality of food they are eating. A high quality, organic butter from grass fed cows can also contain important fat-soluble nutrients that our bodies need. It has been around for centuries and is consumed by some of the healthiest cultures on the planet. Margarine, on the other hand, has been linked to a lower functioning immune system, decreased insulin response leading to diabetes, and infertility. It has been around for less than a hundred years and is consumed primarily by cultures with an exponential growth in dietary-related, preventable diseases. So eat butter and enjoy it’s rich flavour with piece of mind and confidence that you are giving your body the healthy fat it needs to survive and thrive. What are some unique ways you consume butter in your diet?